The future of Yonge and Eglinton is starting to come into focus. Detailed renderings of a planned 68-storey, mixed-use building planned for the southeast corner of the intersection have been released by the developer, giving a clearer picture of what one corner of the midtown intersection might look like in five years time. 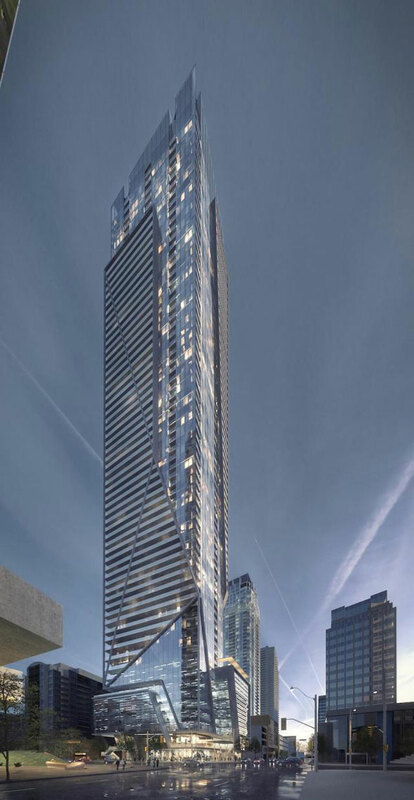 Designed by Hariri Pontarini Architects, the firm behind One Bloor East, the Massey Tower, 5 St. Joseph, and the PJ Condos, 1 Eglinton East is in line to become the third major development at the increasingly development-heavy neighbourhood. The site is currently occupied by an 8-storey office building that includes a CIBC branch at the corner. There's a 7-Eleven in there, too. Upstairs is a 30-suite office building. The project is still in the planning phase and has yet to complete the necessary city council approval process. The 68-storey tower will contain 46,000 sq. m. of residential and 10,400 sq. m. of commercial space. Everything above the 13th floor will be solely for residential units--672 of them in total, split between 448 one-bedroom and 224 two-bedroom units. The underground connections to the subway (and later Crosstown LRT) will remain, though developers plan to add six levels of below grade parking to the increasingly crowded subterranean world. The design is certainly striking. Its looks a little as though there is one building inside of another, bursting to get out. Most if not all of the units will have a private balcony, and those facing south will have excellent views of the downtown core. A privately-owned public square is promised for the west flank of the building, along Yonge St. Though this project will more than likely wrap up after others in the immediate vicinity, construction noise from the LRT project and later redevelopment of the former TTC bus bay lands may be a factor. Because these condos will be in an up and coming area, expect to pay a premium. Good. Developer Davpart has already had success at 481 University, a conversion of an existing office building, and the intersection is undergoing rapid intensification ahead of the expected arrival of the Eglinton-Crosstown LRT in 2020. Kitty corner, the Yonge Eglinton Centre is getting a $100 million makeover and expansion, and across the street the twin-tower E Condos project already under construction.